1 Free Larabar (1.24-1.7 oz., select varieties) in Kroger stores, with coupon. This Kroger Free Friday Coupon is available for download on Friday, May 18, 2018 but you have until June 3, 2018 to redeem it. What is Larabar? Larabar is an energy bar produced by General Mills. The bars consist of fruits and nuts and are made without genetically modified ingredients. Ingredients: dates, peanuts, chocolate chips, sea salt; or fruits, depending on the variety. 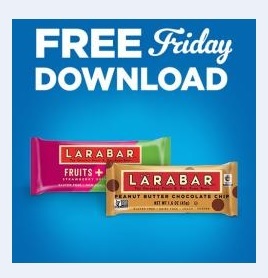 Redeem your coupon in-store within two weeks for 1 free Larabar (1.24-1.7 oz., select varieties). Your coupon will automatically be applied at checkout when you use your Shopper’s Card. Available in most stores.